Aug 28-Sept 6, 2005 -- We left Greece for Italy in the wee hours of the morning. After day sailing and making short hops for the past 2 months in Turkey and Greece, this will be our first passage-making in a while. 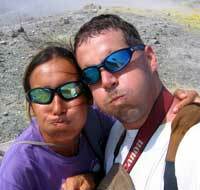 We covered over 300 miles in 3 days to arrive at Vulcano Island. 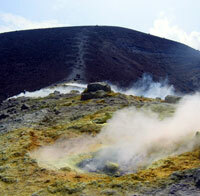 Vulcano sits just north of Sicily and is part of the Aeolian group of islands. As you may have already guessed, there is a volcano on Vulcano! In fact, there is a whole string of volcanoes stretching out across the Tyherranian Sea including the famous Stromboli, Mt Etna, and Mt Vesuvius. The volcano on Vulcano island is active. 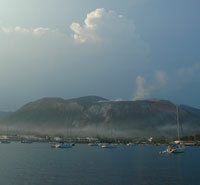 From our anchorage, we could see steam rising from the crater. They say that Stromboli and Mt Etna continue to spew lava and that at night you can watch a fireworks-like display of geologic glory. I had no such luck when I tried to look over at Stromboli at nighttime. 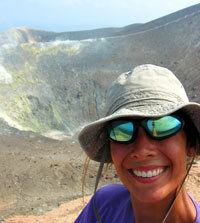 Our real adventure at Vulcano Island was hiking up to the crater. For the privilege of getting sweaty, dusty, dirty, thirsty, and tired we each shelled out 3 Euros (approx $5). The hike took us about 1.5 hours up a well marked trail. The higher we climbed, the stronger the smell of rotten became. Strewn across the mountainside was ash and pumice. You could even make out where there must have been lava flowing at one point in time. 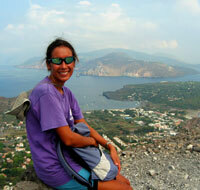 The view of the islands and surrounding bays was breath-taking with sailboats coming and going. At the top of the volcano a huge crater was blown out. The crater must have been a half a mile wide. Along the edges steam and sulphurous gases rose up from the ground. Gotta watch where you step or you could end up with a foot smelling last week’s leftovers. Someone even had the courage to hike down into the crater and spell out www.maxingout.com using rocks … hmm, ok so maybe I didn’t do that, but it might have crossed through my mind. 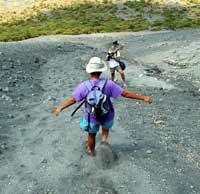 Now, the real fun part of this volcanic excursion was on the way down -- a scoria run! Scoria is a combination of ash, pumice, and other small stones of sand like consistency. 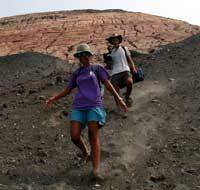 A “scoria run” is the quick way down the mountainside by running and half-sliding through calf high gravel. Yahoo! The rest of the island was dedicated to tourist activities -- sunbathing, mud baths, swimming, shopping, and sampling delicious Italian cuisine. When in Rome, do as the Romans, eh! Of course, we had to eat some real Italian pizza. And then there was divine gelato to indulge in. But before I knew it, it was time to say Ciao! 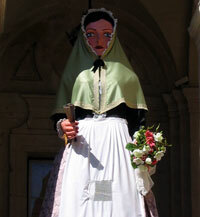 After a few days at Vulcano Island, we headed off again for Sardinia. But the weather was so perfect (flat seas, blue skies, gentle breezes) that the captain opted to head straight for the Balearic Islands instead. The trip was going great until one fateful night when Donna noticed that the port engine was making funny noises! Not a good thing on a windless night. The next morning, the captain hauled David out of bed and tossed him into the big ocean blue to check out the problem. We had a sneaky plastic bag wrapped around the prop. David had to cut the bag off before we could restart the engine. You can check out David's feat of courage in our latest video entry. 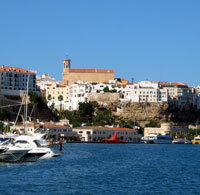 (click here) So here we are in Spain on the island of Menorca! Sept 7-14, 2005 -- Ole!! 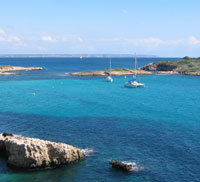 We are enjoying the Balearic Island of Menorca! We arrived just as the sun was beginning to rise on the port city of Mahon. Long a stronghold of the British navy (they say that Admiral Lord Nelson lived here), the British influence is strong here. Huge cruise ships come through every day packed with Brits. The town itself has loads of cafes, shops, and pretty streets. We arrived just in time for the Festes de Gracias. We have still not determined what sort of holiday this is. What we do know is that lemonade with gin is the drink of choice for the festival. David and I unwittingly sampled a large glass of this concoction that we took for regular lemonade. Let's just say that we found it a little strong, and that David's "theatrics" over its strength even worried the shop keeper a little. He ended up sampling his brew and pronounced it just right! For the past three nights, the entire town has been out dancing, partying, singing, drinking, and having a wonderful time. There have been fireworks going off at wee hours of the morning!! Opera on the waterfront. Parades with giant statues through the streets. Yummy local foods to sample -- olives, tapas, cheeses, smoked & cured meats, pastries, candies ... We should be here for the next couple of days and then head off to Mallorca. 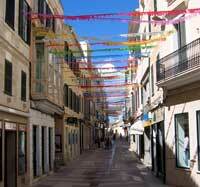 Sept 15-19, 2005 -- Another of the Balearic islands looms ahead of us. Mallorca! I have heard fleeting references to this fabled island for years. A huge tourist destination for the Brits. There are signs everywhere advertising Full English Breakfasts. We sailed into Palma's crowded harbor where we were greeted by harbor patrol -- “Please stay 1500 meters away from the American Aircraft Carrier Theodore Roosevelt.” The navy was in town for a few days of R&R. The marinas were filled with monster huge mega yachts and prices to match. So we opted for a quiet and lovely anchorage a few miles up the coast. Lovely beaches and aqua water line the coast of Mallorca. It could explain the tourists that flock to worship the sun with nary a thing covering them up. 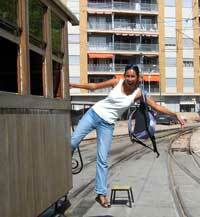 Every day we made easy day trips into Palma which reminded me a lot of Paris. Wide boulevards lined with trees, Gothic cathedrals, art museums, and crazy drivers. 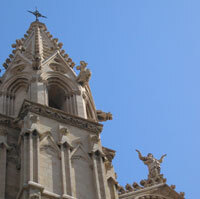 We visited the huge Gothic cathedral at the heart of the city. 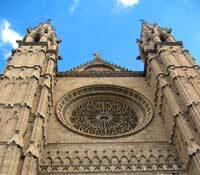 The Spanish began construction once the Muslims had been kicked out of the country in the 13th century. It took 400 years to complete the main building, but the interior continued to be constructed well into the 20th century! How’s that for perseverance! The famous Spanish artist and architect Gaudi even contributed to the cathedrals interior design. 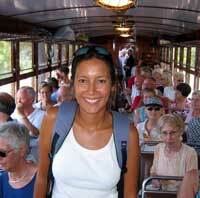 Another highlight of our time here was a crowded train trip into the interior. Standing room only for the 1 hour trip into the mountains surrounding Palma. I wish I could say that the scenery was fabulous, but all we seemed to do was go through a number of tunnels as we passed under and through the mountains. 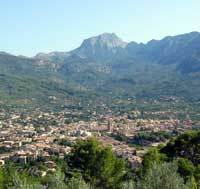 The village of Soller was quiet except for the tourists. We never did figure out why everyone thought this was such a wonderful excursion. If you ever want to go on a really scenic train ride, check out the trip from Cairns to Kuranda in Australia!! Well, this is my final stop in Spain. From here I will be heading to Strasbourg, France and then the US. Stayed tuned for more adventures. We promise never to inhale! is a party animal waiting to break out!